Click to see the best deals available for a Savannah, Georgia vacation on Expedia. We departed Asheville, North Carolina just after lunch and headed to Savannah, Georgia. It was a 5 1/2 hour drive. We would be doing Savannah in one day with kids – actually 2 nights and 1 day. We did some light planning and were excited. 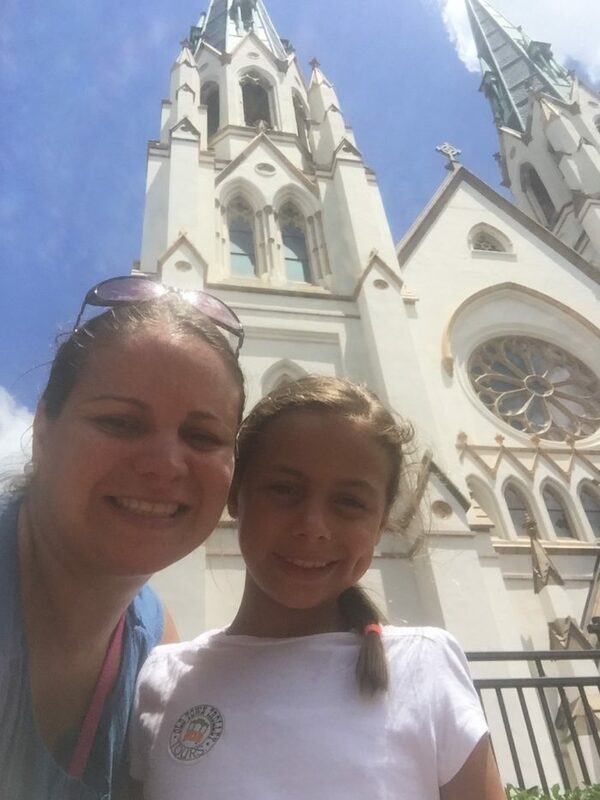 Read our story to inspire your family travels to see, eat and do Savannah, GA, before we headed to Ponte Vedra Beach, FL, the last leg of the trip. We arrived at 6 PM to the Andaz Hotel. We selected the hotel based on location – near the river and of course great reviews on TripAdvisor. We had reservations at 8:30 at Garibaldi’s. We relaxed a bit in our room and enjoyed the complimentary adult beverage given to guests when they check in. Dinner at Grimaldi’s was perfect. The restaurant was more formal than we were expecting. The service was great and the food even better. 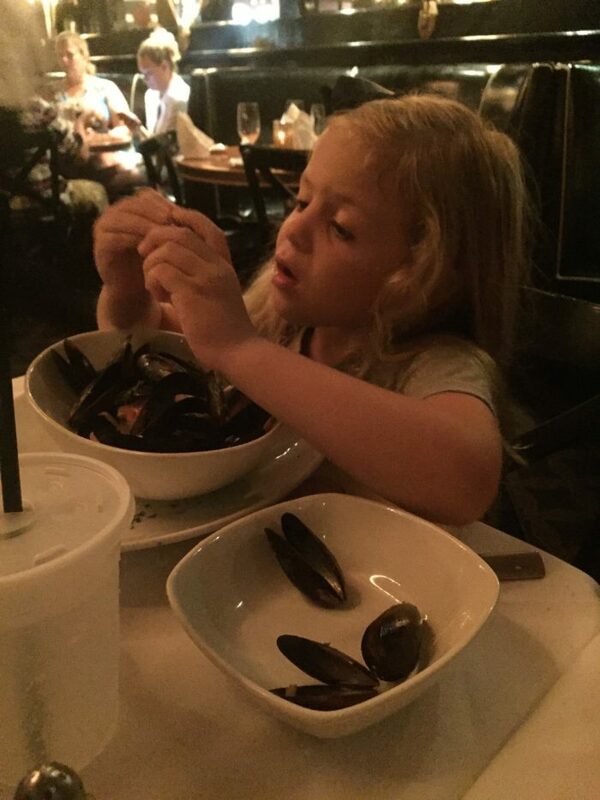 My youngest, most adventurous eater, devoured a plate of Mussels Provencal on her own. We had hoped to walk around City Market, a street in Savannah with bars and entertainment, for some evening people-watching, but the rain that night had us racing through the streets to the hotel. Early the next morning, we woke up and headed out the hotel doors by 9 AM. 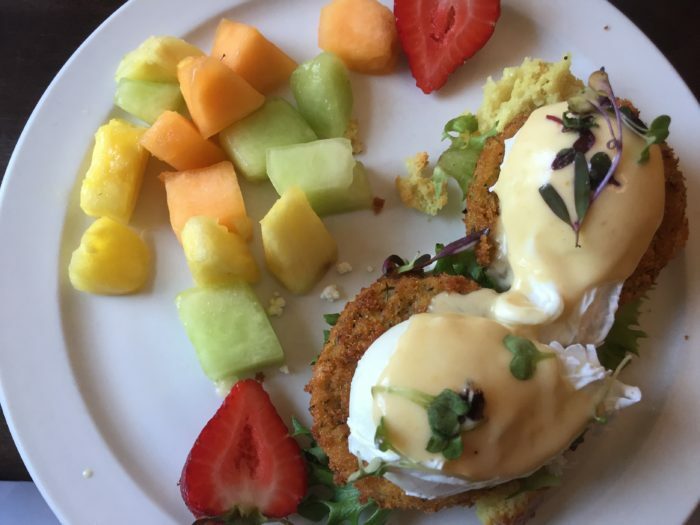 We were recommended by our concierge to a fun breakfast joint, The Funky Brunch. There was a stop for the Old Town Trolley Tours adjacent to our hotel while the summer heat hadn’t set in yet that day, we opted to walk the 5-10 minutes to breakfast. There were griddles at the center of our table at The Funky Bunch. My oldest ordered pancakes and was handed over a bottle of batter and toppings. 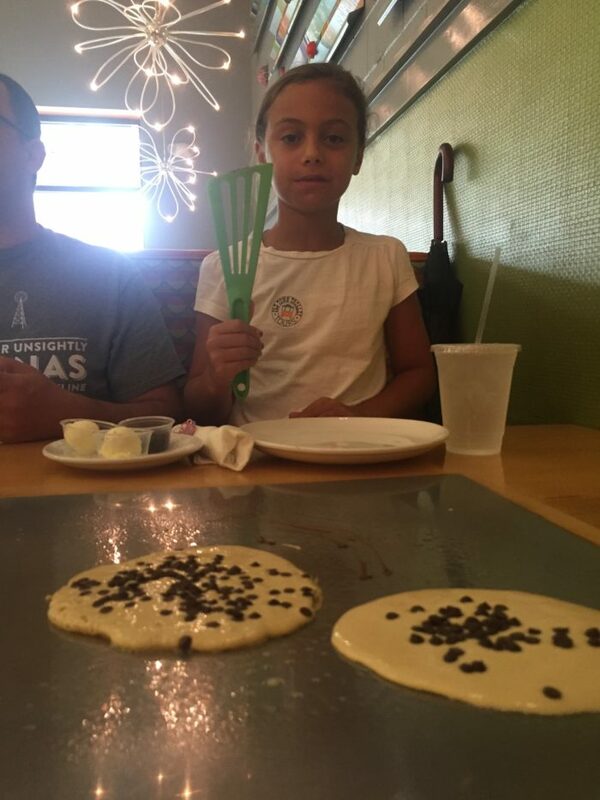 She had a blast squirting out her batter onto the hot griddle to make her pancakes and one for her sister. Tom ordered “Breakfast at Mom’s” – 2 eggs served atop fresh biscuits and southern sausage gravy. He loved it. The experience was fun. Trolley tickets were provided to my family at no charge. Our honest experience is shared below. Our original plan was to use the trolley as a mode of transportation – taking us from one attraction to another. There are 15 stops on the Old Town Trolley Tour in Savannah. Passengers are welcome to get on and off at any point. With this in mind, we sketched out an idea as to which stops would be best to depart the trolley. We first got on the trolley at Stop 8, a block or two away from breakfast. The kids were super excited to be on the trolley. And yes, the kids had us sit all the way in the back. We took out the Trolley map and found that we were just a block away from a stop the moment the first whines about achy feet let out. The moment we re-boarded the trolley we realized it was so much more than a mode of transportation. Our tour guide whose name I so wish I could remember was so engaging and knew everything about Savannah. 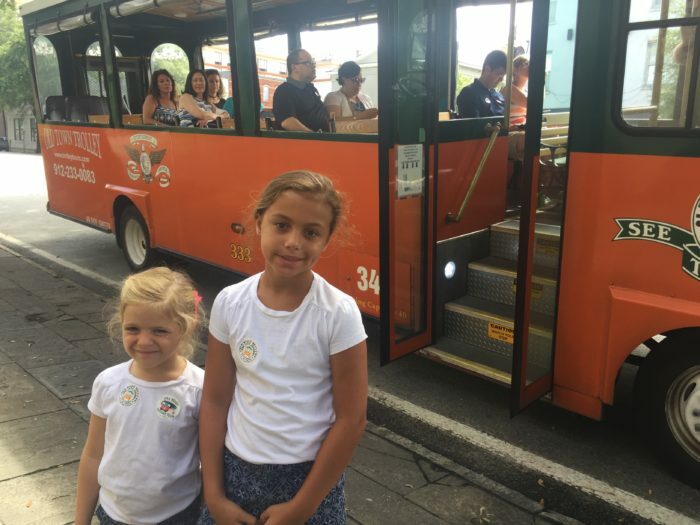 As the kids and adults rested their feet and cooled off from the hot Savannah summer heat, we learned all sorts of interesting and sometimes random details about the history of the city. We learned why certain house were painted certain colors, and why and how the squares got the name or why the roads travel in certain directions. 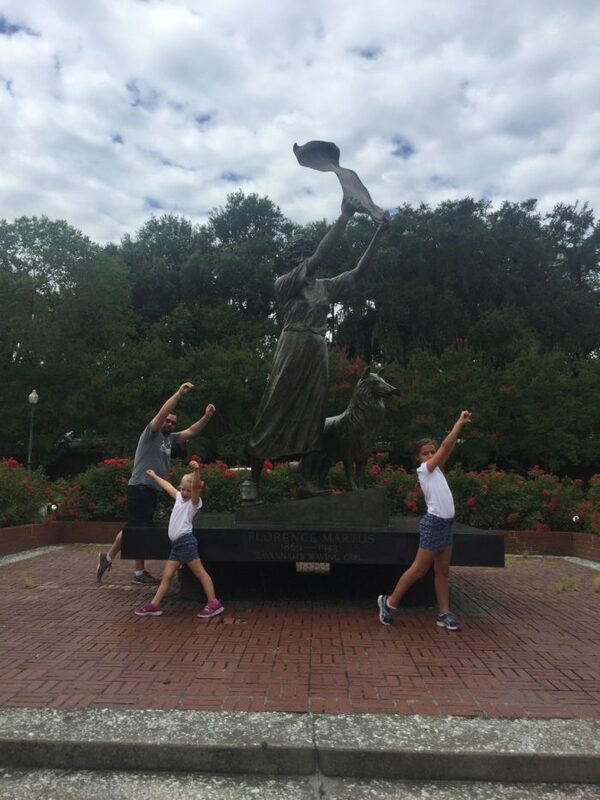 Stop 4: Forsyth Park – let the kids run around! Stop 6: Cathedral of St. John the Baptist – This was an incredible church. We walked into this Roman Catholic Cathedral and felt such peace and beauty. As it has been customary for me as I grew up traveling with my parents, we each said three Hail Mary’s and asked for blessings. Stop 7: City Market – People watching and late afternoon ice cream. Stop 10: River Street – There are lots of souvenir shops along this street. 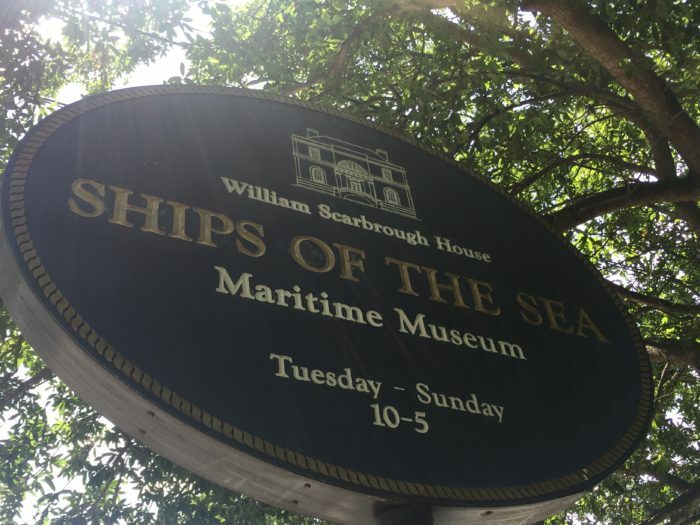 Stop 14: Ships of the Sea Museum – We all enjoyed this museum, especially Tom. Trolley tickets can be purchased online here for $28.80/adults, $11.25/kids 4-12, Free/kids under 4. Prices are higher when you buy them on-site. Did you know that traveling to Savannah with a Girl Scout is serious business? Savannah is the birthplace of the Girl Scouts of America as this is where its founder Juliette Gordon Low was born, married and died. We got off the trolley at Stop 2 to reach the Juliette Gordon Low birthplace. Most noteworthy, this home is the first National Historic Landmark in Savannah. We purchased tour tickets for later in the afternoon since everything was already sold out. We then learned that it is encouraged to pre-purchase your tickets online. Many Girl Scout Troops come to the house for field trips and therefore receive priority to tour the home. A pre-purchased ticket will help you plan your day better, too. Click here to pre-purchase tickets for your visit. We jumped back on the trolley and continued our day until our return for the tour at 4:15 PM. Alas, we returned to the Juliette Gordon Low Birthplace just before 4 so my daughter could check out the gift shop. There were special pins that are ONLY sold at this gift shop for Girl Scouts. Directions are provided to show where to add to the sash/vest. We purchase one, as well as a patch. The guided tour of Juliette’s home was very nice. There were just two families in attendance. The small tour size made it personal. As so many children attend this tour, there was less things roped off and more things to “touch.” It was very interesting to learn about the the challenges Juliette overcame and how she has inspired so many. We even got to see the Presidential Medal of Freedom that she received posthumously. 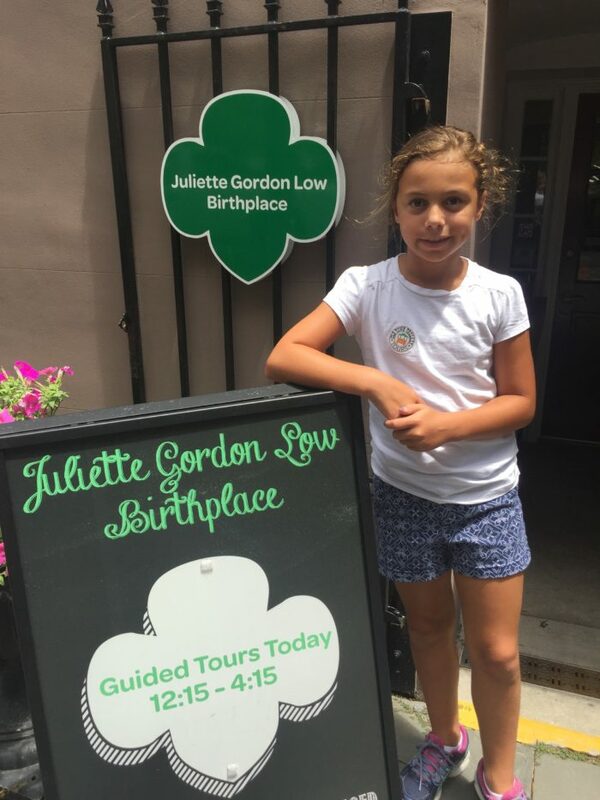 Before heading back for our Birthplace Tour, our next Girl Scouts stop was Stop 6 to visit the Andrew Low House – home of Juliette Gordon Low and her husband and his ancestors. The house was built in 1848. It has been restored and maintained. We paid for a guided tour of the home. As we walked through the home, we learned much about the style of a typical Savannah home and how Juliette opted to update much of the style prior to moving in after her wedding. My Girl Scout purchased an Andrew Gordon Low patch to add to her vest. Our hotel concierge recommended and we “verified” by looking on Yelp, A Lure, a seafood focused contemporary Southern restaurant. It was just next door to Garibaldi’s, where we ate the night before. 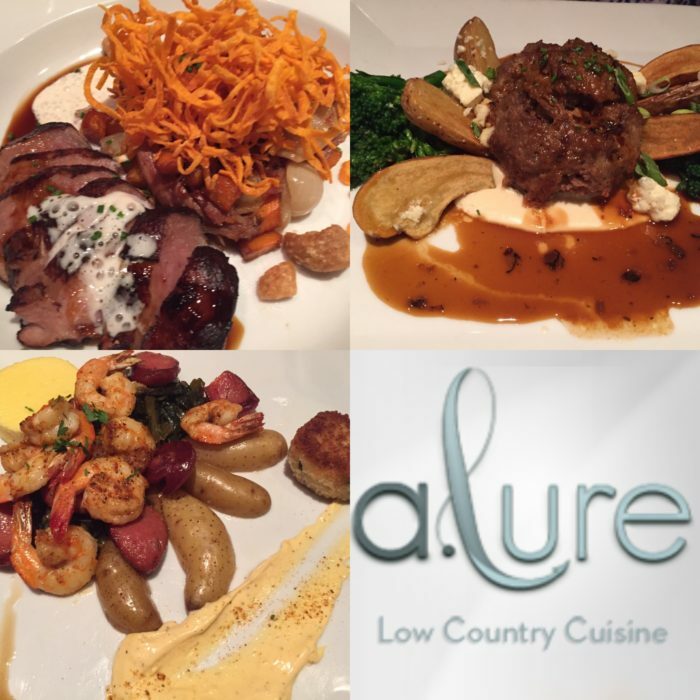 The food was your typical Southern fare but glammed up a bit. We started with a Lamb Carpaccio that came with Blue Cheese Ice Cream. Yes, you read that right. This dish was out of this world! We love beef carpaccio but never have had lamb. Taking a bite with a bit of the ice cream was so good. I ordered a Low Country Boil but it wasn’t what I was expecting. It tasted good yet was a little too simple – maybe because I was still dreaming about my appetizer. My oldest ordered the meatloaf. It was the best meatloaf I have ever tried. All in all, the restaurant was very good. Service was great. In other words, they handled my youngest spilling water EVERYWHERE, very well. A friend recommended B. Matthews Eatery for breakfast, so we headed there the morning before leaving to our next stop of our road trip. The restaurant is located across from Factor’s Walk, Stop 12, on the Old Town Trolley Tour. We arrived around 10 AM on a Saturday, therefore the wait was 20 minutes for a table for 4. We sat on the second floor. This floor is a recently converted apartment into a dining space. We learned that the restaurant was a brothel of sorts in the 1800’s with Pirates coming to eat, drink and be merry. I ordered the Fried Green Tomato Eggs Benedict and it was out of this world good. My older daughter ordered the pancakes with caramelized pecans. The serving was HUGE. Consequently, there really wasn’t the need to order my younger one anything, as there was enough to share. 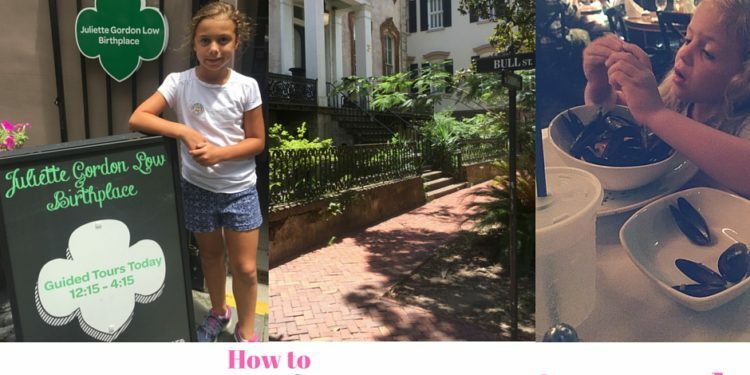 Here are some tips we recommend you following when traveling to Savannah for one day or more with the family. We followed most of these and others so we are now recommending based on our experience. Order your Girl Scout Museum Tour Tickets online, ahead of time. Due to loads of troops walking through their doors everyday and they get priority. Save your spot! 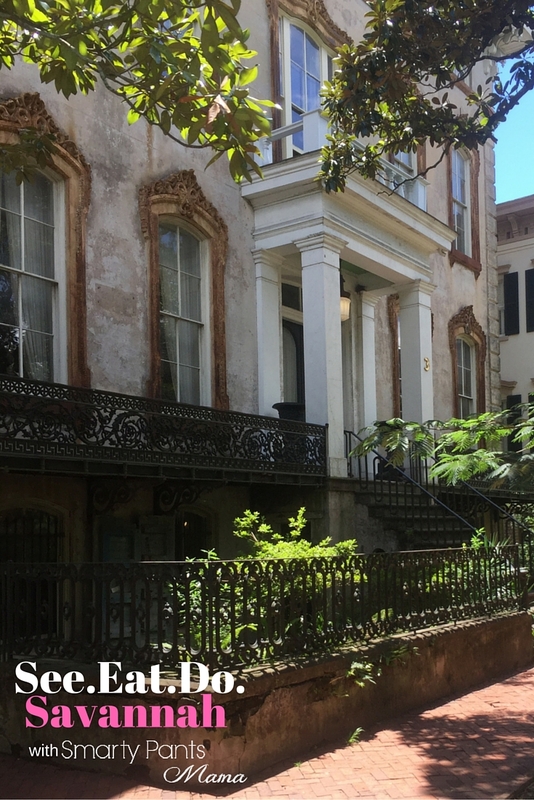 Order tickets for the Old Town Trolley Tour so can then you can learn all sorts of interesting stories about Savannah, rest your feet and stay cooler during the hotter months. When in Rome eat like the Romans. This is so important to us when we travel. Make every effort to enjoy food typical of the area. We selected our dining options to include as much Southern cuisine. Most of all, plan a Savannah trip with just adults. There are restaurants galore and a lot of live music and bars. Would be a fun weekend away! Finally, visit online deal sites for Savannah tourist deals. All things considered, we made some excellent travel decisions in our 40 hour day in Savannah, and some, well, you’ll learn from our errors. We hope to have inspired your family to plan a trip to Savannah, Georgia soon. Now, tell me, what should other families see, eat and do in Savannah, GA? 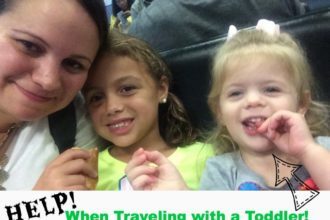 How to Stay Happy When Traveling With Toddlers! I definitely want to take a road trip here! I’ve never been to Savannah, but planning to one day. I definitely agree, when you are in the South, you have to eat Southern food. Seems like you had lots of delicious treats. Yes, the food was incredible. I would go back to do a foodie tour! Sounds like you guys had a great trip! The ghost tours are my favorite! I saw the Ghost Tours advertised. Would love to try that! All of this food looks amazing!!! I have always wanted to visit Savannah but have yet to go. 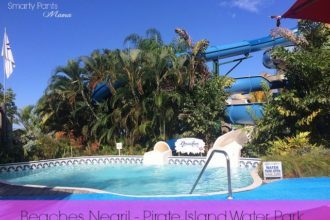 I will def have to check out some of these places when I do! I’ve heard such great things about Atlanta! I’ve been to Savannah once, but would like to go back. My husband/kids haven’t been before. Thanks for the great tips on places to eat! It’s a great place to bring the family and appetite! Looks you enjoyed a lot! I wished that We can go and do that of activities.